Like many people, I became aware of Rae Shagalov’s art when I saw her sitting in the back of Torah classes with pens and paper in hand. For the uninitiated, Shagalov takes notes in a unique, calligraphic style during shiurim offered by rabbis and teachers around the L.A. area. Some of us might doodle while listening to a lecture, but her sketchbooks contain more than squiggles or caricatures. Her signature “artnotes” allow the viewer to internalize words of Torah on a whole new level. A gifted librarian and teacher as well as artist, Shagalov eventually began to share her artnotes with the world via her website, Holy Sparks, (www.holysparks.com.) She’s now collected some of her work into book form in order to communicate timeless Torah messages with the world. 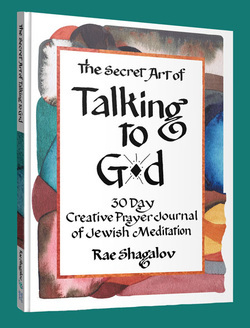 The Secret Art of Talking to G-d guides a reader through 30 days of meditation exercises which aim to improve their connection to the Almighty. This “creative prayer journal” accompanies each day’s exercise with a tool meant to optimize the user’s daily meditational practice. Usually, Shagalov provides a graphic organizer, a chart or other visual tool, but a couple of the more unusual exercises – simultaneously the most silly and yet deeply meaningful – ask readers to make up a song or to dance. Shagalov also injects humor into many of the lessons, such as when she invites readers to kvetch or throw themselves a pity party and then encourages them to turn their thinking around to a more positive tack. While targeted towards newcomers in Jewish meditation, even those who are familiar with a daily dose of hitbodedut will find enjoyment and meaningfulness in using Shagalov’s book for a month. The workbook exercises that The Secret Art of Talking to G-d offers refreshed my daily meditation practice. Even after years of practice, I often struggle to meditate for the lengths of time recommended by many teachers. Adding that extra ingredient – communicating with G-d (and myself) via artistic expression – helped me extend my practice time. That gave me extra insight from each session that I spent in conversation with G-d.
Another bonus to using Shagalov’s 30-day meditation manual was that it forced me to consider a focus for each day that was not of my own choosing. That meant that a couple times, I had to confront personal issues I might have preferred to avoid. Frankly, our avoidance of the most troublesome issues in our lives, those that make us most vulnerable, blocks our ability to grow. Being forced to deal with these issues was uncomfortable, but it was worthwhile for me. The lovely color images brought added pleasure to my reading of this book. The sturdy binding and heavy paper stood up well to wear-and-tear. Shagalov advises using different color pens in your responses; I’d recommend you take her up on that suggestion. Choosing pens provided me with yet another layer of reflection as it forced me sort through my thoughts even more when I selected the right pen for each idea I wanted to record. Readers should be aware that since nearly every day’s exercise involves writing or drawing, they’ll have to modify their use of The Secret Art of Talking to G-d on Shabbos. The first two weeks, I decided to skip the Shabbos lesson, expecting to double-up the next day. Instead, I totally forgot to continue with the manual on Sunday at all. One week, I doubled up on Monday AND Tuesday, but the following week, I just continued on, one lesson at a time, starting Monday. The remainder of the month, I did each Shabbos’s pages without using the graphic organizer. While that meant I didn’t get to benefit from the entire exercise on those days, it meant I no longer found myself forgetting lessons and losing momentum.